New Podcast - Who Dis? Just barely making it under the one month wire, there’s a video version for Patreon supporters and plain old audio for the rest of ya’ll. I have some thoughts on the way Instagram makes me feel and what I might need to do about it. Also - iOS 12’s Screen Time is hopefully going to change things. Sue joins me again to talk about our experience watching December, Acrobat, and a little Irish band called U2 live in Montreal. Ever wonder what the thoughts of a U2 fan’s spouse are? Wonder no more - Sue joins me again to talk about life as a U2 fan spouse in advance of this week’s U2 concerts in Montreal. My wife Sue joins me on this episode to talk about the digital divide that exists in my head, in our social circles, and in our lives. For folks who only listen to my podcast and don’t know what I actually do, here’s an episode explaining a bit about what I do in exchange for money which I use to buy meat and potatoes. Answering a listener question on why I switched from Todoist to TickTick for managing my todo items in life and work. Avoiding your taxes is an important part of being an adult. Knowing when to fold something, walk away, and run. A little bit about Descript, a Mac app for automagical transcriptions of audio, and a little bit about waiting for an adult to come and tell me what I’m doing wrong. Just a reminder to myself as much as any of you - I love doing this. Comparing myself to others I haven’t even met is kind of silly. Recovering from a cold, I bravely soldier on and record an episode of the podcast for you. This episode I talk about how I, a grown 40-something year old manbaby, have figured out scheduling and unlocked the key to productivity. At least for this week. Sometimes I dive into too many projects and then have to spend time pulling back from things. I’m back in the land of ice and snow and it all feels like a 25C fever dream. How green is the grass on the side of working from anywhere? Sometimes it’s a bit of tile, concrete, and salty water and the grass doesn’t actually grow. First podcast recording from Mexico. I’m going Patreon only for the month of March. It’s not you, it’s me. A quick comparison of two microphones - a Heil PR40 recorded into my Focusrite USB mixer vs the ATR2100 recording into my iPad Pro. Can you tell the difference? Price is certainly a difference! Social media is wonderful for data nerds like me. But also awful for data nerds like me. Patreon Lens, Instagram Course sales, and talking to the voices inside and outside of my head. I’m doing an experiment where I try out an iPad Pro to see if I can do most, if not all, of my work from iOS. My comments on what YouTube’s changes to their partner program mean for the indie creators out there. I reorganized my office and figure I should show the Patreon folks how it looks. Hello 2018. Let’s get this thing over with. I’m testing out posting to Patreon first, and the regular feed for everyone else a day later. Will it work? I don’t know. I think I screwed up the date already in the audio of the episode. Except they’re not undoing the money and trust lost. At least not right away. A quick chat about U2’s new album, Songs of Experience, that was released today. Cashing in on your Cyber Monday coupons. This episode is full of cyber monday coupon codes that will improve your cyber Monday by at least 50% if you use coupon code CYBERMYMONDAYISH. A bit of a catchup (ketchup?) episode on what I’ve been up to lately. Help me decide what to do next with a little bit of social pressure. Get that monkey off your back by whatever means necessary. Working through a conversation with a monkey I have nearly every day. Gord Downie died today. And I wanted to pay tribute to him in a small way on my podcast. I wish I could sing because I’d much rather cover his songs but my rambling will have to do instead. Coming down from a job interview, I record an episode with a bit of nervous energy. Hilarity may not have ensued but I feel much better now. Summer mode has arrived and I’m stressed about it. Just make sure you drink lots of water and stay hydrated out there. Catching up with Chris on how Lost Wax is doing. And some lemons. Hey Twitter, What Do You Want to Know? Answering some tweets about music, Costco, and summer. Two things I’m excited about plus conversations with my kids. Now this is a story all about how my life got flipped-turned upside down and I’d like to take a minute just sit right there and I’ll tell you how I became the guy who hadn’t recorded an episode for nearly a month. This isn’t the one where I talk about seeing U2 but it still kind of ends up being that. How I get my brain to move on from subconscious worry to getting things done. You shouldn’t listen to this. Really. A quick interview with Lucy about Kyle along with some thoughts about S Town. Awkward segue? Yes. The one where a hot water bottle attacks me. I was asked what inspired me to become a podcaster. This my answer. Yesterday I did something I’ve never done before and it’s not what you think. Unless you’re thinking I went to a movie by myself. In which case then yes, it’s exactly what you think. Deep breath - the new version of Goodstuff is finally out! It's Cold. Again. Still. Whatever. Ask and you shall receive from the U2 marketing gods. Happy Episode 200. It didn’t fizzle out or die on the vine! It’s been a week plus a heads up for the next episode. We watched Minimalism - A Documentary About the Important Things last night and I had a few thoughts that I’ll try and keep to a minimum, naturally. Special U2 correspondent Christopher Schmitt joins me to talk about U2’s recent tour announcement and decision to milk The Joshua Tree for one more run. A recap of Xmas and a look forward to all things new in 2017. Christopher Schmitt joins me to review and discuss Rogue One, which opened this week in theatres around the world. Is it A New Hope or does it make us want to strike back at the ticket seller for letting us go see it? Give away what you know on YouTube and blogs to show how smart you are and then people will pay you for what you know is what we’ve been told for the last few years. Nuts I say. What’s On Our TV in November? Surviving the Crown in WestWorld? I talk about the shows we’ve been watching in November - a little bit of reality TV, some Netflix drama, and an HBO mystery. A quick germ free update on what’s been going on for the last week or so. Also - stay home if you’re sick you dumb dumbs! I like to think I can multitask and I also like to think I can work without a schedule. Both of these things are wrong. I’m trying to change that. What Do I Find Interesting That Nobody Else Seems To? Some thoughts on getting stuck in a rut and how you help me get unstuck. In a previous episode I asked for feedback and then the form I was using promptly broke — so it’s back and so am I.
I have a couple of helpers for this episode to explain some of the cool things about Rescue Bots and a My Little Pony. Where I’ve been and what’s been up. It’s another wiener weekend though. Less wieners and more work. I promise. Actually I discuss the different ways my business attention is being pulled - WordPress developer, podcast editor, Mac tech support, audio host, and sound fx button pusher. When is it time to focus? When do you just shut up and take the money? I talk a bit about the prospects of turning 40 and open up a bit about the sads in life. Parental PSA - Morning Show should not be listened to over supper. It’s nothing but filth and potty talk. I know my problem is anything but s**. I refuse to admit it. I will not say the s-word. A bit of follow up on my Snapchat 101 course as well as answering a question from listener Aaron Goodwin about what I find interesting that no one else seems to. What I did to tell folks about my Snapchat 101 course as well as how the initial sales have been. Did they meet my expectations? (Yes) Am I quitting my day job and moving to Mexico to be a full time edutrepeneurainer? (No) Listen and find out… oh nvm. I talk about how I put together my Snapchat 101 video course - the apps I used to put it together as well as why I chose to use Gumroad. My Snapchat 101 course goes live today and I already screwed up! I’ve had my head down working on something and - woop! - here it is. Sick followup! Answering the question on everybody’s mind from the previous episode. Upvote Downvote - What’s Going to Happen Today? When is a kid sick and when is a kid not sick? That is kinda the question - maybe? Testing out a Shure MV51 in place of my usual Heil PR40. Listener Question - What Do You Hope to Accomplish? I’m curious what you hope to accomplish with your podcasting endeavours? I know that’s a big question, I’m just wondering what drives you to podcast day after day? I don’t do well without constraints. I’m adult enough to know I need to get stuff done without a teacher or boss telling me to, but I’m still the worst procrastinator at life. Combining two of my greatest loves - eating nachos and podcasting and introducing Anchor.fm. I picked up Firewatch but have only played the first day so official review will wait. I also tried explaining Snapchat to Sue. What do I do when I don’t feel like I have something to talk about? Test out some new technology so I have an excuse to record an episode of course! This time it’s Twitch.tv live stream. Wasting time preparing to do a thing by not doing the thing at all is what I’m best at. Raging against the cold and investigating Loopback and Audio Hijack by Rogue Amoeba. Recording an episode every(ish) day in February means I have to start now. Back to the Frozen Basement With You! Travelling 3,200kms to find out you still have the same shadow you had before you left. A mouthblog in progress. New Year’s Eve plans and adventures and being followed by your issues no matter where you go. Quick travel update and testing out of the Mazatlan recording “studio”. A quick mic test of my new Samson C01U Pro USB condenser microphone. It definitely helps me appreciate the Heil PR40 mic I usually use but I think it’ll be ok for a backup/travel solution. With travel plans ahead, I’m taking Daily(ish) to a Patreon supporters only show for the next little while. Support me on Patreon for a dollar or more per month and you’re in the club! I talk about the other mental blockage that’s been holding me back from podcasting lately. I’m quitting everything and driving truck in Europe. Talking about plans to escape the winter after one day of snow and cold. Taking the advice of one and acting on it. My thought on giving a talk on the basics of using your iPhone and how nerdy I really am. Utterly tired and choosing joy in the midst of being exhausted. The golf is frustrating. To go in front. Thin guy is fat. tgif. There’s not enough Magic devices in my life it would seem. Still alive. Still here. Holy kaw it’s October. Check out my new Patreon video! And I test out a new audio dingus called a Fethead to boost the signal, baby! Feedback Followup Friday and my brother-in-law’s new video and Patreon page you should check out. Venting on Twitter is helpful especially if you’re avoiding vacuuming. I review the 3 movies and a video game that I played/watched this weekend - Harry Potter and the Half Blood Prince, Wild, The World’s End and Terraria. And I claim I have no time to get anything done? My thoughts on how August went recording near-daily episodes, videos for Patreon supporters, and where it’s all going. A bit of FFF wrapped in a brain dump of the useless things I care about and what I could do about it. A few quick thoughts today before getting back to work. Be sure to send in questions, comments, suggestions for FFF tomorrow! My brother-in-law Paul joins me to talk about wifi battles, English PhD’ing, and how we can fix our in-laws. Feedback Follow-Up Friday with a friend - one of my brother-in-laws joins me to chat about Patreon support, ideas for Patreon rewards and recording from a blowup air mattress. Are you keeping up with the daily Daily(ish)? And I break my rule about fight club, sorry. What happens in my brain when things start to cloud over I wonder aloud on the podcast today. Update on the AC issues, working on the weekend and plans to podcast from an air mattress. A rant on checks as well as a bit of Feedback Followup Friday. I’m adding a new Patreon goal! Fix our air conditioner! Back in the Goodstuff North studios recording today’s Daily(ish). Coming back to your own business can still feel like a drag and other things I can’t really justify complaining about and yet I do. A quick chat on what’s fair and what’s equal. A quick episode from the lake while I walk to the coffee shop and try and do some work when everyone else is having fun. I feel your pity. 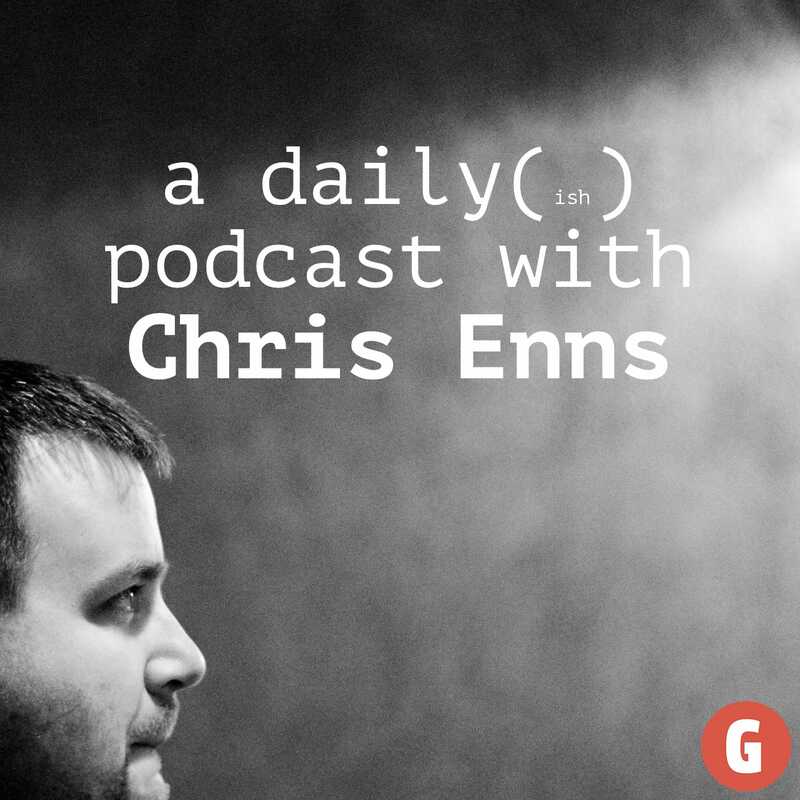 Updates on how the Daily is going versus the Ish, Patreon update and a little bit more U2. Send me your tired, huddled masses of ideas that help fight colds. Blame Canada for the delay of the daily podcasts in August. And also brunch. It’s almost August. One week. Gotta make the most of this thing we call summer. A telemarketer inspired me to be more direct with you. So here goes. We launched a new podcast today on Goodstuff. Don’t listen to this - go listen to that! Happy Canada Day, eh? Warnings of upcoming feed and hosting changes that might not all work smoothly because humans and computers don’t mix. Can a Monkey Have a Name? We have a bit of a crisis in our home and we need your help. Matt McGee from atu2.com joins me to talk about U2, the current Innocence and Experience tour and how being a fan of a band has changed over the twenty years since he started atu2.com. I got some great responses to previous episodes and so I take time on this episode to respond to one of the responses. Hashtag respond! Publishing something on Spoken.co - a new web app built by some of the folks behind Authentic Jobs. What Would I Do With 365 Days? Continuing from the previous episode’s discussion, I talk about the idea of funding development of Goodstuff and whether that would be a good thing or not. Also, how you can support podcasters. Are you ever curious about how a podcast gets from idea to your eardrums? If so, this might be an episode for you. I recorded a chat with Sue as we debate a new show idea for Goodstuff that may (or may not) ever hit your ears in the future. But it’s fun to document the process! Episode 100! A discussion of U2’s Innocence and Experience tour, the new album and anything else that we still haven’t found on the streets that have no name with or without your velvet dress in Miami, New York or California. One. A few rambling thoughts on job, life, focus and drowning out the voices in my head. Summary - I need to figure out how to turn tinkering with my tools into what i do instead of what I do to avoid doing what I do. Talking Sunrise.am. Sue joins me to talk about anything but Survivor so instead we talk about the joy of order. Dates are hard. Why do I not care about the Apple Watch? A crisis of one man’s faith in a company named after a fruit. I’m a little nostalgic for Mad Men as the series closed out with a great finale last night. Paying the person for the things and advice on how to monetize your mattress. I can explain. I can explain. And I do. Goodstuff stuff and a new segment on Daily(ish)? Searching for something that costs more than nothing is a hard thing to do. 20 minutes till the weekend. Watch-a gonna do? My son Mason joins me to share some important news about Rescue Bots and the Apple Watch. If I don’t feel like it, do I have to do it? Update on The ListServe email and getting kicked out of my office. What’s a nerd to do? I won The ListServe and this is what I wrote. How I gave up Twitter and how I went back to it and found myself all over again. Or something like that. It’s almost time to go back on Twitter. What should my first tweet back be? Periscope, Twitter’s new live video streaming app is out. Should you use it? What could you use it for? The answers may surprise you. More after the jump. Some thoughts after watching the documentary Harmontown. Being emotionally vulnerable without being an emotional bag of emotion. It’s not all about puke but there’s a little discussion of puke ok? Thanking an internet friend for superhero movies and picking podcast music. If you don’t tweet about a podcast, does anybody hear? What’s it like to unplug from Twitter for awhile? And where do all my thoughts go that would otherwise have gone out via tweets? Clarification on what I meant by giving up Twitter for Lent in yesterday’s episode. And arguments about podcast listening speed. How do you share photos with family and friends that aren’t necessarily for everyone? And are you giving up something for Lent? I talk a bit about what I’m thinking of giving up and the answer may surprise you. More after the jump. Jumping off a discussion from Lost & Lemon to talk about false humility and confidence. Follow up from yesterday’s episode and some thoughts from my kids on what I do. Will You Be My Fitness Pal on the Hamster Wheel of Life? Podcasting post follow-up and bedtime routines. A roundup of recent activity with apologies for heavy breathing. Testing out Audition for this episode - can you hear me now? And I have a special assistant helping out on this episode. Reminiscing about the pilot of Battlestar Galactica on the 10 year anniversary of it’s release. The weather has changed! iTunes featured my podcast - no, the other podcast. No, no. The other podcast. Wii U Be My Friend? My podcasting insecurities, Wii U arrival, Star Wars update and transparency with Patreon. Christmas holidays, new year ideas and Star Wars for kids. I’m testing out a new (to me) recording program called Hindenburg and so this is me using Hindenburg for the first time. TIRP ended yesterday and I talk a bit about why I felt it was time to say goodbye, despite the fact that it was a ton of fun to do. Also be sure to support me in my campaign to keep Fullscreen off Goodstuff. Details inside. Clean up, clean up. Everybody clean up. A bit of meta podcasting talk related to my Patreon as well as upping our game in podcasting in general. Sorry this episode has been lost somehow! Do I really need help getting milk? What does it really feel like? Some follow up from last episode’s announcement, details on a Goodstuff meetup and how to remember Remembrance Day in podcast form. My thoughts on the Jian Ghomeshi firing and subsequent story in the Toronto Sun and where I stand on the whole issue. Sue joins Chris to talk Survivor again. Was it fun to see Drew get what was coming to him? We thought so. It’s a bittersweet symphony that’s going on in my sinuses. Want me to blow my nose in your ear? New (gently used) pop filter arrived so I had to quickly try it out - thanks Jordan Cooper! A special hello and introduction to Goodstuff.fm for people randomly coming across our network thanks to it being featured in the iTunes Podcast listing. Susan joins Chris to talk episode 2 of Survivor season 29. Not as great an episode of Survivor this time which possibly means not as great an episode of Daily(ish)? You be the judge. Chris tries out a new mic technique and talks a bit about what he does. Do you know what he does? Chris Enns is joined by Susan Enns to chat about the start of season 29 of Survivor. Why do they still watch it after all these years? What do they think about this season’s guests, the show format and Jeff Probst’s silly questions? Money makes my world go around unfortunately and I get kind of frustrated by how it’s changed. Link-bait title notwithstanding, Chris talks a bit about how success is perceived in our culture and his own struggles with running a business and the successes and failures along the way. iOS 8 will be released sometime today - a few thoughts and a word of warning regarding iCloud Drive. Chris is joined by Christopher Schmitt to discuss the recent U2 album release in depth - the way it was released by Apple, the backlash online to getting a free album and our thoughts on which song to listen to if you want to go beyond the single. Chris talks in brief about some of the ways he manages his to do list and projects. He’s got plans for a deeper dive on this and related topics. Having pre-order remorse. I think I’ll go buy something to help forget about it. I’m still buzzing from the new U2 album surprise and do a quick review of it. Could Song of Innocence be their best album of the 2000’s? My quick recap of the Apple event yesterday including which iPhone 6 I think I’d upgrade to. My thoughts on Apple Pay, the  WATCH and U2’s appearance and new album. I wish I could say more… so I will. My thoughts on Apple’s special event tomorrow including new iPhones and wearables of all sorts. I follow up from the travel episode with responses from listeners and how things went for us. Minivan design tips and a way for Canadians to recover from losing Tim Horton’s by playing Threes! Podcasting - Why do people still have no clue? Travel - How do you do it with kids? Do you give in to the tech or abstain? I’m looking for tips as we pack up for a trip of our own. A half hearted Patreon campaign and a new podcast network launches on the internet. Talking about shuttering SSKTN.com the domain and the mixed emotions associated with it. Follow up from a listener and an example of why I shouldn’t record before I’ve had my coffee. Getting Serious About Patreon. Maybe? I talk about a discussion I had with my brother-in-law on Lost and Lemon about video editing, which lead to thoughts on doing a Patreon page which leads to my plans to actually launch a Patreon project. Whew. Blaine joins Chris this week to talk Amazon Fire Phone, Starbucks free University tuition, Angry Birds Transformers, playoff beards and Slingshot vs Snapchat. It’s Tech Talk Tuesday time and I’m joined by Kari Halsted to talk about MosoConf 2014, a local mobile social conference Kari attended last week. Also, Bill Murray. A few thoughts on Myke Hurley’s announcement that he’s leaving 5by5 for something new. I’m joined by former co-host and friend Blaine Korte to discuss this week’s headlines and news as we saw it. This week - Minecraft, Instagram, MAC addresses, can opener case, Star Wars and Snowden. Bear with me as I run this little experiment. I had an idea to do a quick look at things I found interesting around the web on Tuesdays and Thursdays - my usual podcasting days - and record it in the Daily(ish) feed. Like it? Hate it? Email me or hit me up on Twitter with your thoughts. I talk about a post I wrote for my grandpa who is dying in the hospital. A few thoughts on life, death and healing. I’m back from vacation and need to remind myself to go again. I talk about taking a break, having a head cold and my mic almost falls off. Not a euphemism. Another bee in my bonnet episode - shysters and frauds in the IT industry that try and do everything rather than focusing on just doing a few things really well. Talking through another blog post - this time on helping determine what’s an opinion vs fact in client work. A quick episode today where I’m joined by two special guests. They won’t be on every episode but they’ll pop up from time to time - as long as they don’t eat the cables or pull the mic off and destroy it. Today I wanted to talk a bit about the joys, or lack thereof, of owning your own business. I want to err on the side of being more positive than negative about life in general, but I also want to be open and honest about struggles. So here goes. I talk about the Goodstuff 8 hours of streaming day and developing something as a creative person and then handing it out for feedback and getting stomped on. How do you develop a thick skin as a creative person? Goodstuff has it’s official launch tomorrow - 8 hours of streaming. Here’s my thoughts on that and a few other things this Monday. Welcome to new listeners from the iTunes feature in New and Noteworthy in the USA. I want to talk about using an iPhone 4 with iOS 7 -specifically iOS 7.1. A blog post has been in my brain for awhile but can’t get it on the digital page so I’m starting with a audio version first. I talk about collaborative building of things - in particular Goodstuff.fm. It’s so much better to go as a group than go it alone. Welcome to Daily(ish) on Goodstuff.fm. I talk about the main reason for the break in episodes - some feedback I received from a friend after episode 9 - and how asking for feedback from the wrong people can be detrimental to your process. I love podcasting and I’m not afraid who knows it. I talk about about Patreon and my thoughts with it, my struggles with how much to share on this podcast and the new season of Survivor has started. What are you watching these days? This is not a weather podcast. Or is it? Jumping off from Shawn Blanc’s daily podcast discussion on creating the internet you want to see. Getting stuck on work and how to unstick yourself. I talk about the idea of changing the tools I use to help switch my brain back to work mode. I talk Netflix, House of Cards, getting sick and The Lego Movie. Everything is awesome. A late Friday edition of the show where I talk about local vs internet focus, and a bit about sponsorship and local meet ups. Apologies and Promotions. So Sorry. Episode 4 is something I’m deeply sorry about. And yet I’m still going to promote the heck out of it. So sorry. I’m back behind the real microphone and mixer for this episode. Episode 2 is an attempt using just my iPhone to record. As an audio nerd I don’t like the quality but I also want to be able to do this show more regularly which means finding a way to sacrifice a bit of quality while maintining consistency(ish).